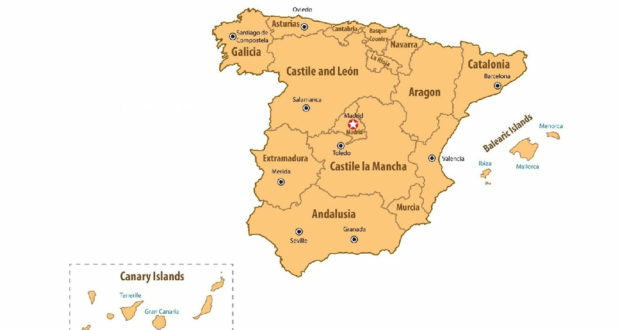 With all of the uproar on various fronts domestically- the NFL player protest, the crisis in Puerto Rico, etc.- there has been very little written in the states about a secession referendum in Spain that is scheduled to take place on Sunday. The first question of concern is whether or not the referendum vote will actually take place. The Spanish government is doing everything in its power to keep the vote from happening. Why? 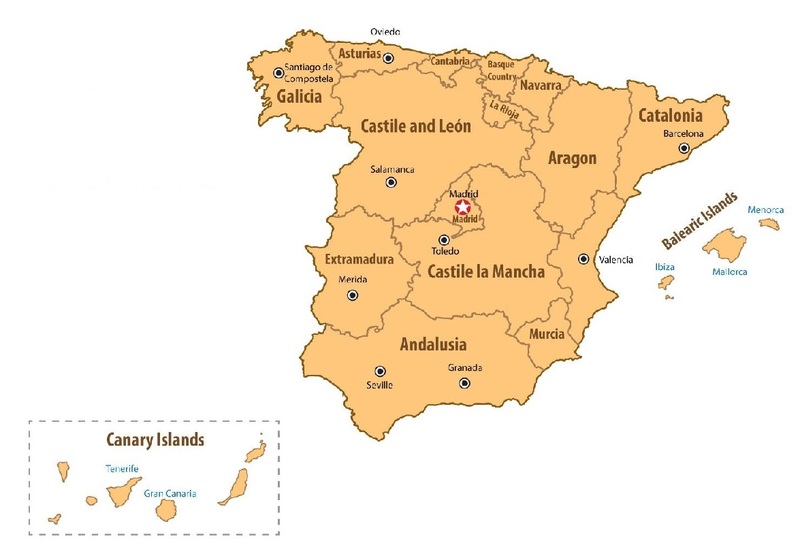 The Catalonia region is one of the wealthiest regions in Spain. The region’s economy is larger than that of Spain’s neighbor Portugal and it is responsible for approximately 20 percent of Spain’s overall GDP. With the region producing so much and holding so much wealth, Catalonians feel they are taxed more heavily than other regions and therefore seek their independence. It wasn’t long ago that Spain was grouped together with other countries that were known as the PIIGS- Portugal, Ireland, Italy, Greece and Spain. They were grouped together as they were viewed as economically weaker following the worldwide financial crisis in the first decade of this century. For Spain, its growth rate was muted during the financial crisis and for a few years after the crisis. From 2013 through 2015 the GDP growth improved and has now stabilized in the last two years. As the economy improved, the interest rates on Spanish government bonds declined and this has helped the government debt. Should Catalonia succeed and gain independence, what will happen to Spanish government bonds? My thought is that investors instantly view them as being riskier without the tax revenues from the region. This would mean that issuing debt would cost the government more money and it will also lead to a selloff in debt that has already been issued. Debt being newly issued with a higher interest rate causes previously issued debt to lose value. That is the only way sellers can attract buyers, by lowering the value to bring the bond’s yield in line with the newly issued debt. 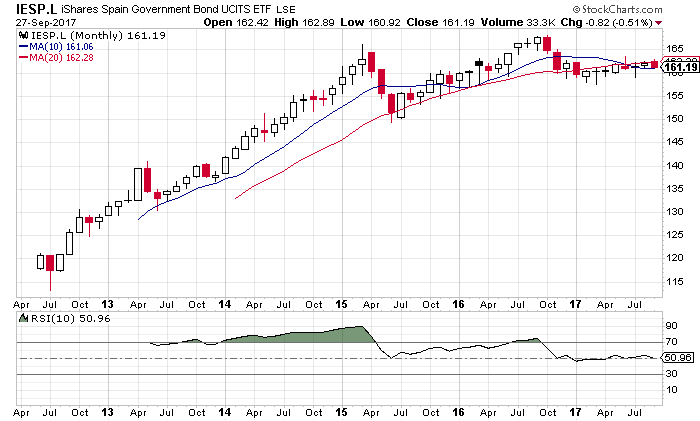 For those that have the ability to trade on the London Stock Exchange, there is an ETF that trades in Spanish Government bonds. The iShares Spain Government Bond UCITS ETF (LSE: IESP) moved higher from mid-2012 through early 2015, but has been moving sideways for the better part of the last two years. If Catalonia is successful in gaining its independence, I would look for the IESP to suffer a downturn. My expectation would be that in addition to government bonds falling, stocks in companies in Spain not headquartered in Catalonia would also fall. Losing the tax revenues of one of the wealthiest regions might cause the government to raise taxes in order to meet obligations. This would have the opposite effect of what we saw in the US this week as President Trump’s tax reform ideas were unveiled we saw a jump in stock prices. If Spain is forced to raise taxes, it will hurt the bottom line of corporations headquartered anywhere else but Catalonia and thus potentially inducing a selloff in Spanish stocks. There are a couple of ways investors could take advantage of a dip. There are a number of Spanish stocks that trade in the US as American Depository Receipts. I put together a list of seven that are listed and also see a decent amount of trading activity and they are presented in the table below. On the list are two banks, a pharmaceutical company, a telecom firm, a retailer, a publisher and an energy company. You could sell one or some of these stocks shorts to take advantage of a decline or you could buy put options on those that have options trading available. 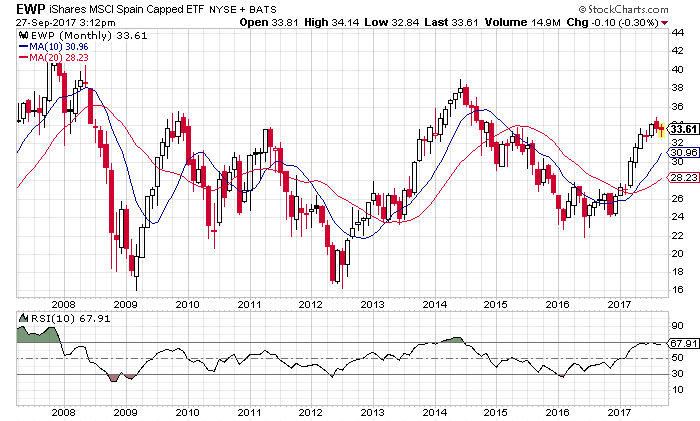 As with most things these days, there is also an ETF that represents the Spanish stock market and that is the iShares MSCI Spain Capped ETF (NYSE: EWP). We see on the chart below that the EWP has been climbing over the past year and is close to overbought based on the 10-month RSI. Like the stocks above, you could sell the ETF short or you could buy put options to take advantage of a decline. With the referendum set to take place on Sunday, if it happens, the time to act would be now. If the vote is in favor of seceding the reaction will be immediate. Even if the secession is disallowed in the future, the possibility of a split between Catalonia and Spain will likely have a negative effect on Spanish stocks come next week. Can Trump Stop the New Persian Empire?